10 students organised by the UK Biology Competitions Committee and the Royal Society of Biology. It stimulates students’ curiosity for the natural world and encourages them to take an interest in biology outside of school. Some questions are set on the school curriculum, but they also extend beyond the syllabus, and reward students whose knowledge of the subject has developed further by reading around the subject, and through the watching of natural history programmes. The competition involves two online tests, covering a range of topics, from Ecology to Physiology, Evolution and Biochemistry. performance, whilst Saatvik Kambhampati, Sabia Choudhury, Aanchal Kalwani and Charlotte Cooper were commended. This is an impressive outcome for them all, and very encouraging for our Year 9 entrants, who can participate again next year. 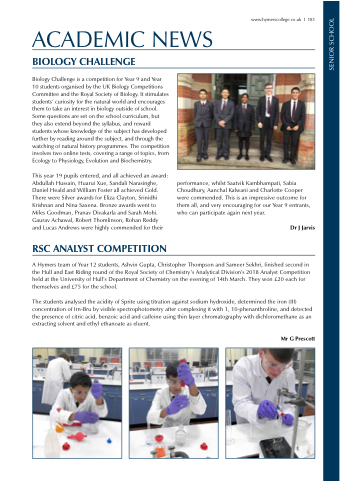 A Hymers team of Year 12 students, Ashvin Gupta, Christopher Thompson and Sameer Sekhri, finished second in the Hull and East Riding round of the Royal Society of Chemistry’s Analytical Division’s 2018 Analyst Competition held at the University of Hull’s Department of Chemistry on the evening of 14th March. They won £20 each for themselves and £75 for the school. The students analysed the acidity of Sprite using titration against sodium hydroxide, determined the iron (III) concentration of Irn-Bru by visible spectrophotometry after complexing it with 1, 10-phenanthroline, and detected the presence of citric acid, benzoic acid and caffeine using thin layer chromatography with dichloromethane as an extracting solvent and ethyl ethanoate as eluent.